Ah, the common cold. I do my best to embrace it with gratitude. A cold can serve as a reminder, for example, to slow down and take some time for self-care. 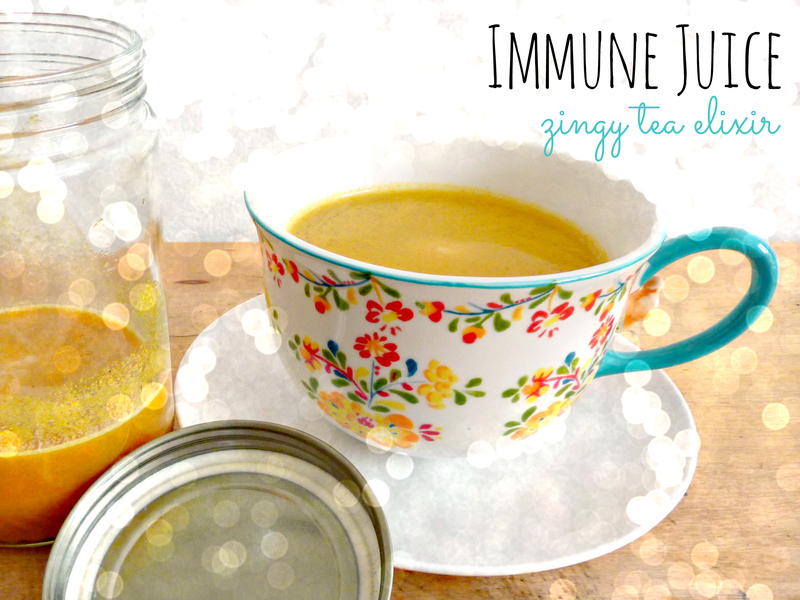 When the sniffles creep up, one of my fave ways to pamper myself is to indulge in a delicious immune-boosting beverage. Since I happen to be suffering from a particularly nasty little bug this week, I thought I’d share the recipe for my zingy Immune Juice. It will warm you to your core* and tingle your senses. Is it intense? Yes. But it’s also strangely satisfying, and it will kill your cold. How? Honey – Raw, unfiltered honey contains several different flavonoids, which possess well-documented antioxidant activity. According to a study in the Journal of Medicinal Food, honey may stimulate the production of antibodies during an immune response. In this particular recipe, it also makes the drink palatable. Lemon – Not only are they a good source of vitamin C, lemons contain loads of antioxidants and anti-inflammatory agents. It also happens that the limonene found in the peel contains anti-cancer properties. In fact, a University of Arizona study showed that drinking black tea with lemon peel actually reduces the risk of skin cancer by 30%. 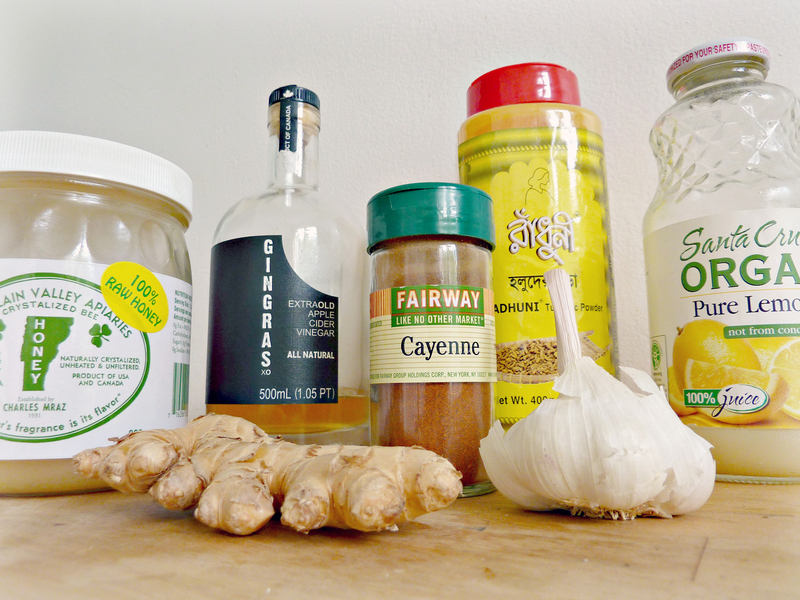 Garlic – As heath remedies go, garlic goes back – waaaaay back. It was mentioned in the world’s oldest medical text, the Egyptian Ebers Papyrus. It helps fight the common cold through its antimicrobial activity, working against viruses, bacteria, parasites, and fungi. Studies show that garlic not only reduces the incidence of colds, but also the duration of symptoms. And its healing properties don’t stop there: it’s also a natural anticoagulant, it reduces plaque in the arteries, it lowers “bad” LDL cholesterol without lowering “good” HDL cholesterol, it has chemoprotective properties, and it may be effective for use in weight control, lowering blood pressure, insulin, triglycerides, and even preventing weight gain in rat studies. Ginger – In Ayurveda, ginger is known as the “universal remedy.” Like garlic, it contains powerful antiviral and antimicrobial properties, and it’s great for boosting the immune system. Studies suggest ginger aids the cardiovascular system, the gastrointestinal tract, and that it helps with pain and fever. It also inhibits growth of human colorectal cancer cells, lowers cholesterol, and is antitumorigenic. It has been used for centuries to help improve circulation in both Ayurvedic and Chinese medicine. And let’s not forget that ginger can be just as effective as a Dramamine in combating nausea. Turmeric – This spice is actually a member of the ginger family, and its medicinal properties have been established in Ayurvedic, Chinese, and Western medicine. Turmeric’s active ingredient, curcumin, is an anti-inflammatory agent that has been shown to be virtually as effective as the medication Phenylbutazone. Turmeric is a powerful antioxidant, and Deepak Chopra suggests it with honey to coat the throat at the first sign of soreness. That’s not all – the active ingredient in Turmeric also has an anti-tumor effect, demonstrating that its medicinal properties are as multifaceted as its deliciously complex flavor. Cayenne – This spice contains an impressive profile of phytochemicals and nutrients, including zinc, B vitamins, and vitamins C and E. Cayenne helps thwart colds, sinus infections, and even sore throats (it can relieve pain when applied topically). I think of it as a great facilitator, because it acts as a catalyst for other nutritional compounds and aids in digestion. Water – The bottom line with any sort of liquid remedy is that it gets you drinking, and hydration is key in getting rid of a cold. No magic involved. 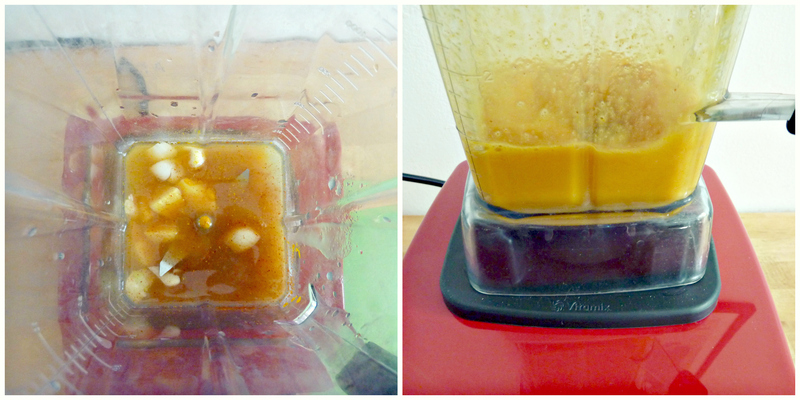 Blend all the ingredients in a high speed blender until the mixture is smooth and totally incorporated. Boil water and pour some into your favorite mug. 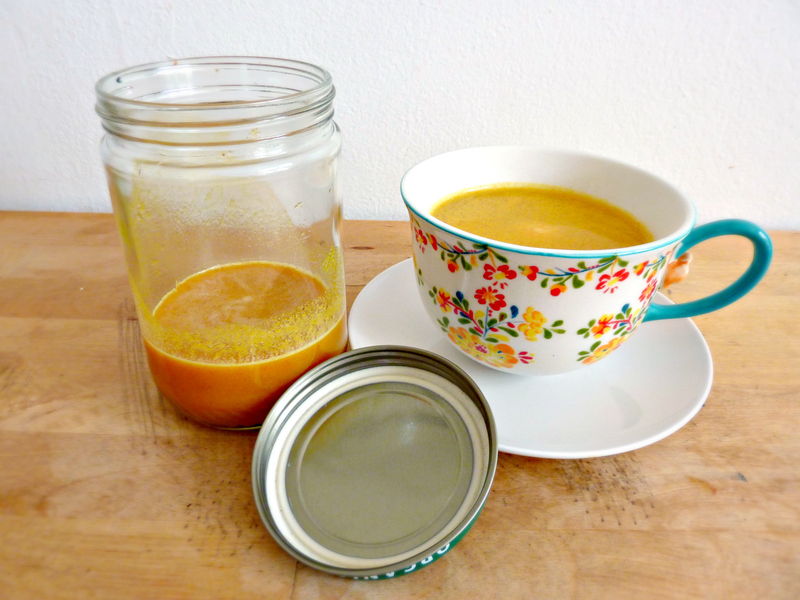 Stir 1 tablespoon of Immune Juice into the hot water, allow to cool, and enjoy! *If you’re living in a warm region, or suffering through summer in New York City as I am, please consume Immune Juice carefully. It really is quite warming and can create some imbalance if you don’t take precautions to keep yourself cool. **Some of these ingredients, such as garlic, lose potency after preparation, so drinking your Immune Juice sooner will give you more bang for your buck. And microwaving can destroy these compounds entirely, so don’t even think about it. Balch, Phyllis A., C.N.C., (2010). Prescription for Nutritional Healing, Fifth Edition. New York: Penguin Group (USA) Inc.
Bowden, Jonny, Ph.D., C.N.S., (2007). The 150 Healthiest Foods on Earth: The surprising, unbiased truth about what you should eat and why. Gloucester, MA: Fair Winds Press.